The Samaritan sukkah is quite different from the rabbinic sukkah, both in its symbolism and in its construction. The mitzvah of building a Sukkah derives from Leviticus 23:42-43, but the symbolism goes beyond the booths in the wilderness. For rabbinic Jews, the sukkah symbolises either the dwellings in the wilderness or the clouds of glory. (3) In Samaritan tradition, the sukkot remind us of the Garden of Eden. Hence, we express the symbolism of Eden by covering the Samaritan sukkah with luscious fruit. A close examination of the Torah text explains why our sukkot look the way they do. Take these four things and do what with them? Rabbinic Jews understand that they should hold the branches shake the lulav and etrog. (5) Samaritans understand, on the other hand, that these species should be taken and used to build the sukkah. Other than the requirement to use palm fronds and the custom of using lilac chaste trees, the choice of greenery and fruit is wide open. The fruits (פרי עץ הדר) hang from the bottom of the sukkah’s frame (see addendum for details). On average, the fruit on a Samaritan sukkah weigh about 350 kg (750-800 pounds). Above the fruits we place open palm branches (כפות תמרים), and on top of that, dense boughs of thick-leafed trees (ענפי עץ עבות). Alongside these, we place the lilac chaste trees (or some alternative), brought from the banks of Israeli streams and wadis (ערבי נחל). Thus, we join all the species together to build the sukkah, as the Torah commands. Jews build their sukkot outside, whereas we build ours inside the house. Neither preference appears explicitly in the biblical text. This custom developed out of necessity; one of the High Priests made the halachic decision over 1500 years ago. For millennia, local authorities persecuted the Samaritan community. For reasons of safety, the High Priest decided that it would be best not to call attention to ourselves by building our beautiful—and expensive—sukkot outside for all to see. (8) Furthermore, our non-Samaritan neighbours would sometimes be tempted to steal some of the luscious fruits hanging outside, effectively ruining the look of the sukkah and spoiling the mitzvah. The decision to build the sukkah inside points to an important difference between Jewish and Samaritan halacha. According to Rabbinic Jewish halacha, having a sukkah underneath a roof is invalid. (9) The Samaritans, on the other hand, do not believe that it matters where the sukkah is built. On Sukkot in the year 1912 some Chassidic Jews from Jerusalem came to visit him. During their conversation, they asked him: “Doesn’t the sukkah being inside ruin the kedushah (holiness) of the sukkah?” Abraham Tsedaka answered that it did not and said that he could prove it. He began to recite the Shema and sing the psalm of the Sukkot holiday and the sukkah began to shake (quite a frightening experience under all that fruit!) The moment he finished the psalm, the sukkah stopped shaking. The Chassidic Jews thanked their host and left the sukkah stunned, and Abraham Tsedaka offered a prayer of thanks to God for granting him the opportunity to demonstrate the holiness of the Samaritan sukkah. Another difference between Samaritan and Jewish practice has to do with where we sit when we use the sukkah. Jews sit inside (or in our terms directly underneath) the sukkah. In fact, Jews believe that they do not fulfil the mitzvah unless they are underneath the sukkah(11) סכך. However, Samaritans do not sit underneath the sukkah, but close beside it. We set the seats up around the frame of the sukkah. The reason for this is obvious. If you sit underneath a Samaritan sukkah, you are in peril of being hit by falling fruit. Considering the size of some of the fruits we hang, including pomelos and eggplants, the danger is real. One final difference between the structure of the Jewish sukkah and the Samaritan sukkah is that Jews build their sukkot with walls (a minimum of 2½, but usually 3 or 4) and consider them to be part of the sukkah, whereas Samaritans are concerned only with the roof. The Harvest Festival (חג האסיף) is the third pilgrimage of the year to the holy sites on Mount Gerizim, and we recite special prayers on each day of the holiday. During these meals, joy reaches its peak. We dilute the clear arak, produced just before the holiday at home, with the waters of the mountain springs until they turn white as milk. Then they are decanted into throats filled with the cheerful Sukkot songs. A large variety of salads, peeled almonds soaked in water, oven-baked broad beans and assorted baked goods add to the joy. The traditional baked goods include baklawa, ballurieh, maamul, kuzmaat, ’aidi, and mkammar. We also drink khshaff, made from the juice of apricots, almonds, and pomegranate. On Shemini Atzeret, the eighth day of Sukkot, the service begins after midnight at the synagogues and continues for 9 hours. We start at this time since, according to Samaritan lore, immediately after midnight the gates of heaven open and angels come down to earth to gather the prayers of Israel. One important ritual that we perform during this service involves the Torah scrolls. 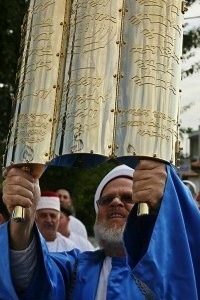 (14) The kohanim (priests) carry the Torah scrolls around to all the worshipers and, in turn, we each touch the scroll cases. As the days of the Harvest Festival pass, the smell of ripening fruit becomes increasingly pungent. The fruit may be enticing but it is forbidden to eat them during the holiday. They are considered holy and may not be used or even touched throughout the holiday (in rabbinic parlance, the fruit is מוקצה). If a fruit falls off the sukkah on the holiday, we place it in a box for safe-keeping until after the holiday. After the holiday, when we take down the sukkot, we must deal with half a ton of fruit! We are required to make use of the fruit ourselves; selling the fruit would be a grave sin. In order to avoid wastefulness, we fill the days after Sukkot with the production of fruit juice and the eating of fruit. One dish in particular has significance for the coming holidays. We take the skins of the etrogim (especially the giant Yemenite ones) and the pomelos that hung on the sukkot – these fruits have very thick skins – and make them into a special marmalade(17) (אתרוג מסוכר). We eat this extremely tasty preserve during all of our holidays. We then gather the dry leaves from the sukkah (ענפים יבשים וכפות תמרים יבשות) and burn them in bonfires. (18) The burning of the dry leaves is not only a practical matter, or even just for fun: it also has symbolic significance. Just as the Jews experienced the loss of their sacred Temple in Jerusalem, similarly, at several points in our history we lost access to our sacred space on Mount Gerizim. The bonfires commemorate the recapture of the sacred mountain from the hands of the Byzantine Greeks almost two thousand years ago (see story below). (19) In this sense, it might be fair to think of the night after Shemini Atzeret as a kind of Samaritan Hanukkah, except with bonfires instead of candles. The story goes that that during the time of Baba Rabbah, in order to ensure that no Samaritans would alight upon Mount Gerizim, the local Byzantine authorities placed a magical bronze bird on the mountain that would warn the garrison of an approaching Samaritan by calling out “Hebrew! Hebrew!” if any were to set foot on the mountain. In an attempt to undo this spell, Baba Rabbah sent his nephew Levi to Constantinople, posing as a young Christian, and with instructions to infiltrate the church hierarchy. Levi became such a successful student that he was promoted to bishop. Then, using his exalted position, he asked if he could make a pilgrimage to the Holy Land, and his request was granted. Levi went to the Holy Land and spent the night at the monastery on Mount Gerizim. Upon his arrival, the bronze bird began to screech, “Hebrew! Hebrew!” The guards ran out to search but found nobody but the visiting bishop. They listened to the screeching for hours, then Levi suggested to the monks and the soldiers that the bird had apparently outlived its usefulness, since, apparently it screeched for no reason. There was a general agreement to this conclusion, and the bird was smashed. That night, while the monks and soldiers slept, Levi stole out of the monastery and returned to his village of Awarta (about 8 km southeast of Nablus), and told his uncle what happened. Baba Rabbah gathered the young Samaritan men and attacked the Byzantine garrison while they were sleeping and reconquered the mountain for the Samaritans. in order to pass the message around quickly, the men lit bonfires on the tops of the mountains. All this occurred on the night after Shemini Atzeret. This is why —according to the legend— we light bonfires on this night, to commemorate the heroic act of Levi and Baba Rabbah, and the retaking of Mount Gerizim, the holy mountain of the Samaritans. The Harvest Festival is the most joyous of all the Torah’s pilgrimage holidays for Samaritans. I have tried to give the readers a taste for it in this piece, but really the only way to get a feeling for Samaritan Sukkot it to experience it. For years, Samaritans have kept an “open sukkah” policy on this holiday on the non-festival days (i.e., not on day 1, day 8, or Shabbat), and outsiders often take the opportunity to come by, sit underneath the sukkah, and experience the joy of the Harvest Festival for themselves. For those who will be in Israel during the holidays, I hope you will join me for a cup of ale and a piece of cake near the sukkah. First, we build a metal frame (most Samaritans already have one and reuse it each year). Generally, the frame is anywhere between 2-4 square metres; some are even bigger. Many Samaritans attach this frame to the ceiling of the living room with hanging chains; others place the frame on four strong poles. Whatever method one uses, the construction needs to be very sturdy, since the average weight of the fruit on a Samaritan sukkah is about 350 kg (750-800 pounds), depending on the size of the frame. Then, we place a wire mesh upon this frame. Some people tie reinforced metal wiring on the mesh, in circular, elliptical or square patterns. 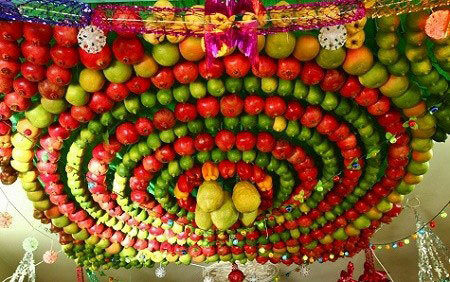 This allows the sukkah builders to hang the fruit in a variety of geometrical shapes. Then, we attach the mesh to the frame with strong plastic brackets. Once we have completed this skeletal frame, we hang the fruits. Before we can hang them, however, someone must attach a brass wire to each of the hundreds of fruit, so we can attach them to the wire mesh. The girls of the house do this earlier in the day – their delicate touch will not (usually) damage the fruit. The children then line up to take the fruit with the wires out of the boxes where they are stored and pass them up to the teenagers and young adults, who hang the fruit from the mesh or the reinforced wires. In advance, we decide the exact location for each fruit, generally according to species and colour, so that we produce a precise pattern. Although we may use any fruits, we have popular choices, including citrons, pomelos, pomegranates, lemons, quinces, grapefruits, oranges, red and green peppers, eggplants, apples, and peaches. Above the fruits, on the top of the frame, we place open palm branches, alternately spread out right-side-up and upside-down. Then, above them, we place dense boughs of thick-leaved trees close together to form a thatched roof. Alongside we place the lilac chaste trees (or some alternative), brought from the banks of Israeli streams and rivers. With that, with have joined all the species together, and the sukkah is in accordance with the Torah’s commands. 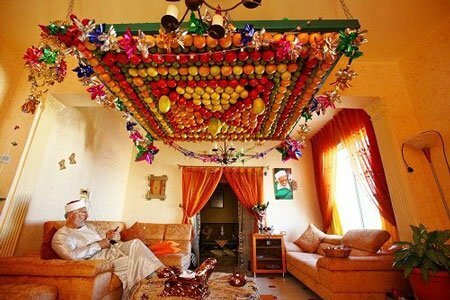 In addition, many Samaritans also hang coloured paper and coloured electric lights underneath the fruit to further decorate the sukkah, though this is not a requirement. I use the term “Israelite Samaritan” in the title as a compromise term. In fact, we do not refer to ourselves as “Samaritans” at all, but as “Israelites”, more specifically, as “The Sons of Israel, Keepers of the Truth of the Torah” (see The Keepers). Nevertheless, since we have been called Samaritans from ancient times until the present day, we make use of the term when discussing ourselves with members of the the outside world for simplicity’s sake. So, I have adopted this convention here. Like the Jews, we do not pronounce the Tetragrammaton (the four-letter name of God). The term Shehmaa is the Aramaic version of the same locution used by Jews, Hashem, meaning, “the name”. Once in each prayer we pronounce The Name only by its four letters, one by one י-ה-ו-ה, perpetuating the ancient use of The Name in Samaritan liturgy. בסכות תשבו שבעת ימים כל האזרח בישראל ישב בסכות. למען ידעו דרתיכם כי בסכות הושבתי את בני ישראל בהוצאי אתם מארץ מצרים אני י-הוה א-להיכם. All Torah quotes come from the Samaritan Pentateuch (SP). All English translations of the SP come from, Benyamim Tsedaka (translator and editor) and Sharon Sullivan (co-editor), The Israelite Samaritan Version of the Torah: First English Translation Compared with the Masoretic Version (Eerdmans, 2013). As you can see, I transliterate the Hebrew names according to Samaritan pronunciation. For more on this, see the TABS essay, Why We Sit in the Sukkah and Jeffrey Rubenstein’s TABS essay (forthcoming). ולקחתם לכם ביום הראישון פרי עץ הדר כפות תמרים וענפי עץ עבות וערבי נחל ושמחתם לפני י-הוה א-להיכם שבעת ימים. Technically, deoraita holding the lulav is the mitzvah, the shaking is a rabbinic practice (derabbanan). Technically, any of the deciduous plants that grow on the wadis near Shechem would do, but the lilac chaste trees are a favorite choice. This is the same reason most Jews light Hanukkah candles indoors even though the practice was once to light outdoors. Interestingly, some Israeli Jews have begun to light outside again. No Samaritans build their sukkot outside though; it would require a decision of the high priest to make that change. See Shulchan Aruch, Orach Chayyim, “Laws of Sukkah” 626. Rosh Yarok Press, 1999, 144 (Hebrew). Although we generally make the pilgrimage on the first day, it can be made up on any of the six following days if, for whatever reason, someone could not make the trip on the first day. We are aware of the Rabbinic and Karaite interpretations of Exodus 12:16, allowing them to cook on the festival, but we understand this verse only to mean that pre-cooked food may be eaten on the holidays, not that cooking or fire may be used on the holiday itself. Although this ritual is a celebration of Torah, and occurs on the same day as Jewish Simchat Torah, it has nothing to do with the Samaritan Torah-reading cycle. We do not begin and end our Torah reading cycle on Shemini Atzeret like Jews do, but on the Shabbat following Shemini Atzeret. We keep our faces covered for a little more than a second. This is a standard Samaritan gesture, used whenever we pay respect to the Almighty, to Moses or the forefathers. We do this many times during prayer, including whenever the priest waves the scroll of the Torah before the worshipers. Rosh Yarok Press, 1999), 142 (Hebrew). This practice is reminiscent of the Jewish custom in Israel on Lag Ba-Omer. Unfortunately, in Holon we no longer burn the dry branches for legal reasons; the city authorities charge us a 750 NIS fine for burning the dried leaves. Instead, we bring them to a central dumping area for disposal. In Kiryat Luza (the Samaritan neighborhood on Mount Gerizim) however, we still burn the dried leaves. The time of Byzantine Christian rule was particularly difficult for us, since during part of this period we lost access to Mount Gerizim and suffered persecution and the loss of more than half of our population through pogroms and forced conversions. Rosh Yarok Press, 1999, 143 (Hebrew). If that night is Shabbat, we start the night after Shabbat. Why do we start right after Yom Kippur? On a practical level, the amount of time we have for building between Yom Kippur and Sukkot can be very short, depending on when the holidays fall in relation to Shabbat. (Obviously, we cannot build on the Sabbath). The reasoning is not only practical, but also spiritual. On Yom Kippur, we receive atonement for our sins. Our Sages tell us that, with this atonement, we should consider ourselves as having been born again. Accordingly, we should approach the coming days with this mindset. Demonstrating this renewed strength and vigour, each member of the congregation prepares for the next holiday by beginning to build the sukkah that very night. This idea has a parallel in the Jewish custom as well, although many Jews begin their construction even earlier than this, and others wait till the next day or even later. This is similar to the more recent custom of a “sukkah hop” that has developed in the non-Samaritan community. This is wonderful! I believe you are the genuine authentic “Orthodox” Jews, because you are more ancient than them; the so called “rabbinic” Jews. Hope to meet you someday. Great community! Keep going.